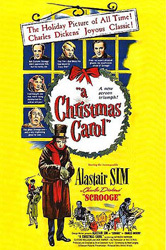 Synopsis: Alastair Sim’s tour-de-force performance as the ultimate miser, Ebenezer Scrooge, has almost single-handedly made this beloved version of Charles Dickens’ story into one of the best-loved Christmas films of all time. Some of Britain’s best filmmakers united behind Sim, who was joined by a delightful cast of accomplished and acclaimed English actors; creating what many today believe to be the best and most faithful production of Dickens’ immortal tale. Wow… what can one say about a classic that is familiar to all, has been discussed at length, and is as omnipresent as ‘Scrooge’ is during the holidays? Known in North America as ‘A Christmas Carol’, it is considered by many as the ultimate interpretation of this story. Whether it is or not, it is terribly hard to match – let alone surpass. As aged as this film is, I’m amazed by how potent it remains. Especially in light of how saturated our culture is with various takes on this tale: there are countless straight versions of the story already, but if one were to include knock-offs, re-imaginings, comedic or satirical versions, the list would be endless. It had been many years since I’d last seen it and had been eager to watch it for the last few Christmases. I was waiting it out until I could get my hands on a really nice edition of it, however, because I want it to be a go-to film during my holidays (snicker, snicker… maybe it’s because I relate to the character, or something along those lines. I’m certainly not The Christmas Cheer Man! ). There are very few occasions to watch Christmas-related films, when you think about it. Whereas one can watch romantic comedies or dramas at any other time than on Valentine’s Day, it feels quite out of place to be watching a Christmas film during… I don’t know… a sweltering month of July! Thus, I try to make the most of the occasion while it lasts, digging up old favourites, classics and throwing in odd bits to keep it fresh. I was quite looking forward to this, but it took a few minutes for me to get into it for some reason. Once I was engaged, however, the movie gripped me to the last second. It was everything I remembered and wanted it to be: it has a fascinating central character, a very original concept (at least, at the time of its writing), pitch-perfect inspirational values and heart. While there’s a fine array of actors on hand, this is for all intents and purposes The Alastair Sim Show: most of the story revolves around his character, Ebenezer Scrooge. And, even though many scenes don’t feature him, his character is never too far behind, either watching the scenes intently or casting a long shadow for minutes at a time. Alistair Sim is absolutely brilliant! While he’s not wholly realistic, he demonstrates his talent by playing such a wide range of emotions. It’s quite impressive,actually: towards the end, he would laugh heartily all the while incorporating almost a half-dozen laughs in one go. And yet he also managed to play the polar opposite, mean, dreary and soul-suckingly sober. The special effects are terribly dated, but it’s as good as a British film from 1951 could muster. Let’s face it, they never had budgets to rival Hollywood productions – then or now. But it doesn’t matter, because they manage to make their intentions clear and, anyway, the film is imbued with a human touch that you just can throw money at, that no special effects can accomplish. I’m glad that it was made in Great Britain, quite frankly, because the film benefited tremendously from its locations; there’s a vibe, an atmosphere, that you simply can’t really replicate in the studio. And, if you tried, you’d have to have many massive sums of money to do it (not that it would necessarily work!). I can’t recommend ‘Scrooge’ enough. I’m sure that, if I hadn’t seen it as often as I’ve had over the years or been exposed to the tale in so many other forms, I would be much more enthusiastic about it. As it stands, I’m a bit saturated, but I still can’t help but get pulled in by this particular incarnation of Ebenezer Scrooge’s story of redemption. It’s truly a wonderful film.